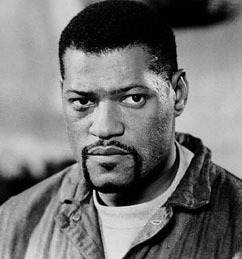 Laurence Fishburne began acting on stage at the age of 10. He appeared on One Life to Live beginning at the age of 13, playing a street kid who sold illegal drugs but wised up when he was adopted by loving black parents. It was the early 1970s, and Fishburne's TV family was the first African-American family storyline on a soap opera. At 14, he made his film debut in Cornbread, Earl and Me, with Rosalind Cash and Bernie Casey. At 16, he lied about his age to get a role as a baby-faced soldier in Francis Ford Coppola's Apocalypse Now, and spent a year with Martin Sheen and Dennis Hopper, filming in the Philippines. Fishburne's later roles include Midget in Coppola's Rumble Fish, Cowboy Curtis on Pee-wee's Playhouse, Cuba Gooding, Jr.'s father in Boyz n the Hood, a loathsome Ike Turner in What's Love Got to Do with It, and of course, Morpheus in The Matrix and its sequels. On Broadway, he played King Henry II in The Lion in Winter, and won a Tony for his 1992 role in Two Trains Running. He has been Emmy-nominated four times, winning twice, and was Oscar-nominated for What's Love Got to Do with It.